In what looks to be a bid to preempt Apple's anticipated fall iPhone announcement, Samsung is said to be prepping the so-called "Galaxy Gear" wearable computing device for an unveiling at its "Unpacked Episode 2" event scheduled for early September. SamMobile, a blog covering Samsung mobile devices, "can confirm" that the South Korean tech giant will reveal its rumored "Galaxy Gear" smart watch at the "Samsung Unpacked Episode 2" event on Sept. 4 in Berlin. Previously, the special media event was expected to showcase the company's next-generation Galaxy Note III phablet. 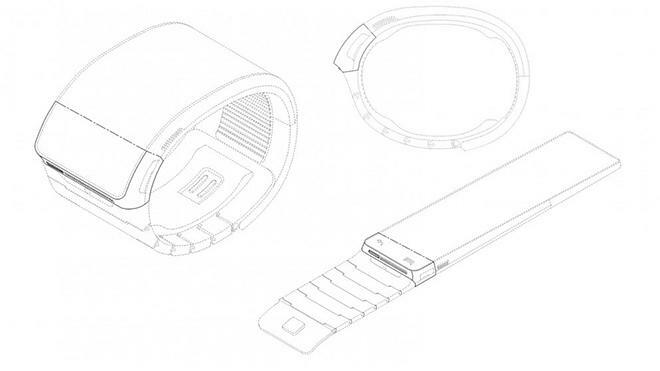 According to the publication, Samsung's Galaxy Gear will act as a companion device to existing Samsung Galaxy products. The final design of the rumored wrist computer is unknown, though a patent filing (above) that has been making the rounds could illustrate how the product may look. A U.S. trademark application for "Galaxy Gear" was filed for earlier in August, describing a "Wearable digital electronic devices in the form of a wristwatch, wrist band or bangle capable of providing access to the Internet and for sending and receiving phone calls, electronic mails and messages." In March, amid a flurry of Apple "iWatch" rumors, a Samsung executive revealed the company is working on yet another entry into the wrist-worn computing segment. Samsung has already fielded two failed attempts in the category. A quick check with the U.S. Patent and Trademark Office shows the Korean company has no shortage of "wearable computing" filings, including wrist-worn devices ranging from bracelets, to gloves, to hats. Apple has also filed its own patent application for a wrist watch-like device and is currently seeking trademark rights for the "iWatch" name in a number of countries.